Des O'Dwyer and his '48 Ford. DES O'Dwyer comes from Katanga, north of Numurkah, Vic. From an early life in farming Des got into trucks some 30 years ago. Driving for Doug Treece out of Numurkah, most of those years were spent heading north to Brisbane or west to Perth. These days Des is in a transition to retirement, working fewer days and mainly driving intra-state. "If I threw my mobile away I'd be right - I wouldn't get a job," he said. Like many in the industry, Des would love to tinker with a big rig in these, his latter years. Like many also, his bank balance doesn't extend to having a Mac or a Kenworth sitting around in his backyard. So Des looked around for something that would satisfy his trucking blood without taking him to the financial cleaners. What he eventually found was a 1948 Ford pick-up without a motor. When he got the "baby truck" it had a flat tray which didn't suit Des' sense of style, so one of his first jobs was to replace that with a pick-up tray. The next job was to source some running gear. The original 239 side valve was long gone so Des went for the indestructible 302 Windsor matched to a C4 transmission. "I must admit I would have liked the 351 Windsor donk but they were impossible to find. They were all in hot rods, boats and speedway cars. No matter, the 302 works a treat," he explained. The 302 is close to standard but has a different came to aid towing. Des has an old Fordson tractor weighing over two tons and swears that he doesn't know it's on the back when he tows it to various tractor-pull events in the area. "We've been up to Kununurra hauling a 21ft caravan and she did it with ease. Gave me a grin each time we passed everybody's towing favourite - the Land Cruiser - going up hills, he said. "She left them for dead! I'll admit that the ride in the old Ford might be just a smidgen rougher than the 'cruisers, but I'll trade that every time to see the looks on their faces as we blew them away." Des's wife passed away late last year and the caravanning is on hold for the time being. "I miss her. She was a good lady," he said. As he talks of his wife Des has a hand on the fender of the old Ford and it is easy to see this vehicle also has a special place in his heart. When asked what he thought the '48 might be worth, Des replied, "Don't know, don't care. I'm never going to sell her". Big truck, small truck - a truck is a truck. 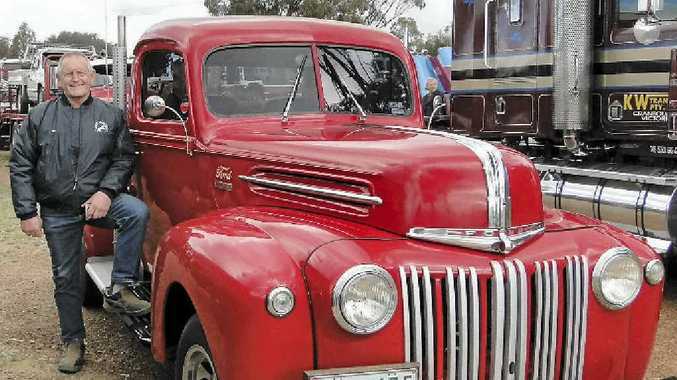 Des O'Dwyer and his '48 show that there is something out there that will fit into the budget of just about every truck lover.